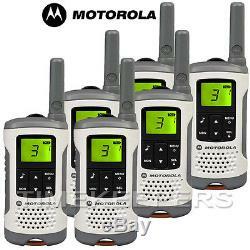 6Km Motorola TLKR T50 Walkie Talkie 2 Two Way PMR 446 Compact Radio Six Pack. 6km Motorola TLKR T50 WALKie Talkie Two Way Licence Free PMR Radio - Six. This model does not support headsets. The TLKR T50 radio is fully featured, tough and stylised which is ideal for staying connected during the outdoor adventures such as whilst camping, hiking or on a day out at the theme park. These shock-proof walkie talkies are making easy to keep in touch with your friends and family. The TLKR T50 is packed with features and functionalities. The T50 walkie talkies are licensed free and included key features such as LCD display, 8 channels and free calls up to 6 km range depend on terrain. Further this is designed for using standard NiMH batteries in the emergency. Finally the charger pod is designed to charge the handsets and batteries. Up to 6km range (subject to terrain and conditions). 8 Channels + 121 codes. Talk Confirmation Tone / Roger Beep. TX Power - 500 mWatt. Bandwidth (kHz) - 12.5. Of Channels - 8 + 121 codes. Talk Range - up to 6km. Dimensions (W x D x H) - 5.5 x 16.5 x 3.0cm. Weight - 140g (excluding batteries). Power Supply - Mains adaptor/Charger Pod. Battery Life - NiMH (Supplied) - approx. Belt clip and carrying loop. 6 x TLKR T50 radios. 6 x NiMH rechargeable batteries. 3 x UK AC adapter. Instruction manual in English, French, Deutsch, Spanish, Pycckuu, Italian, Portuguese, Nederland's, Polish, Turkish, Dansk, Svenska, Norsk, Suomi. Charger Pod chargers handsets with batteries or batteries by itself. Intended for use in the following countries: Austria, Belgium, Bulgaria, Croatia, Cyprus, Czech, Denmark, Estonia, Finland, France, Germany, Greece, Hungary, Iceland, Ireland, Italy, Latvia, Liechtenstein, Luxembourg, Netherlands, Norway, Poland, Portugal, Romania, Slovenia, Spain, Switzerland, Turkey, UK. Item comes with a 230V UK mains adaptor. If you intend to use it outside of the UK you will need an appropriate converter. Our mission is simple: to deliver quality, branded products at affordable prices. As such, we offer a full range of branded goods specialising in retail and wholesale. Our commitment to serve you with a better online shopping experience shows in our wide range of consumer goods. Our inventory is continuously updated with new brand lines and models. We always put our customers first. No matter how large or small the order we aim to give you a first class service. Manufacturers prices direct to the public on most products. Large collection of brand name products. This guarantee excludes pierced earrings for hygiene reasons. In the unlikely event of your item arriving damaged or faulty, please ensure that you notify us within 7 days of receipt and we will provide a replacement. Failure to notify us within this time period will invalidate the return request. All helicopters must be checked for full function before being flown. Ground test instructions, advice and tips are included with each item. If your item is faulty upon arrival, it must be reported to us within 7 days of receipt, after ground test and before take off, no exceptions. No helicopter is indestructible whether real US military bullet proof Apache, remote controlled electric-, turbine-, gasoline-powered, or large, midi or micro. Most spare parts are available to order. Please do not remove the wrapping or resize the strap if you intend to return the item. Be the First to Know. Get all the latest information on Events Sales and Offers. Sign up for newsletter today. The item "6Km Motorola TLKR T50 Walkie Talkie 2 Two Way PMR 446 Compact Radio Six Pack" is in sale since Saturday, November 24, 2018. This item is in the category "Mobile Phones & Communication\Radio Communication Equipment\Walkie Talkies & PMR446 Radios". The seller is "timekeepersint" and is located in LONDON. This item can be shipped worldwide.